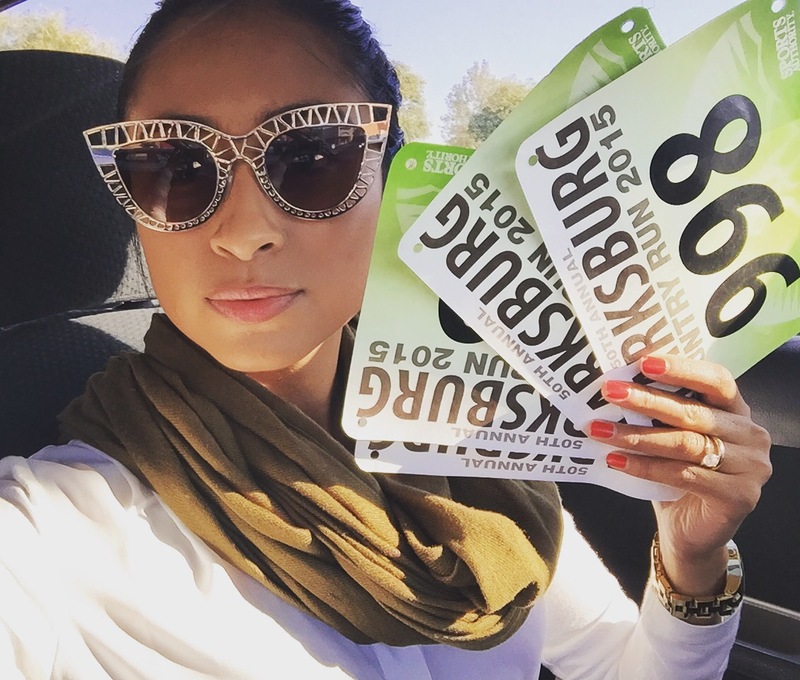 Check my out flossin with our Clarksburg race bibs. 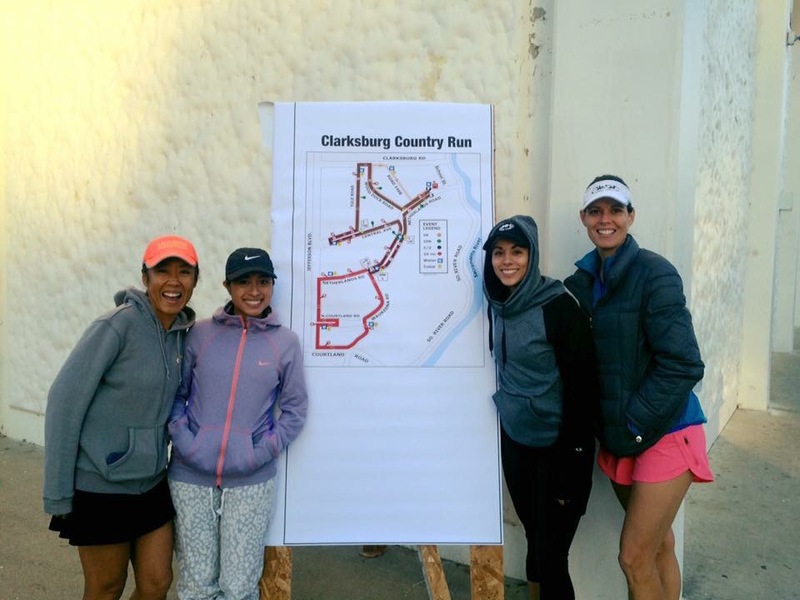 The Clarksburg 20 miler race is the longest run we will be running for our CIM training plan. 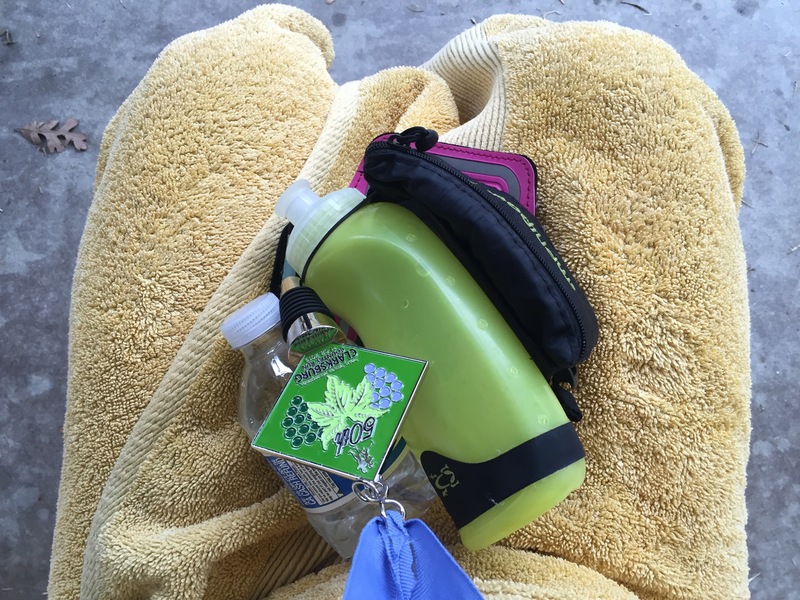 Preparing your body physically, emotionally, and mentally all week takes a lot of preparation. 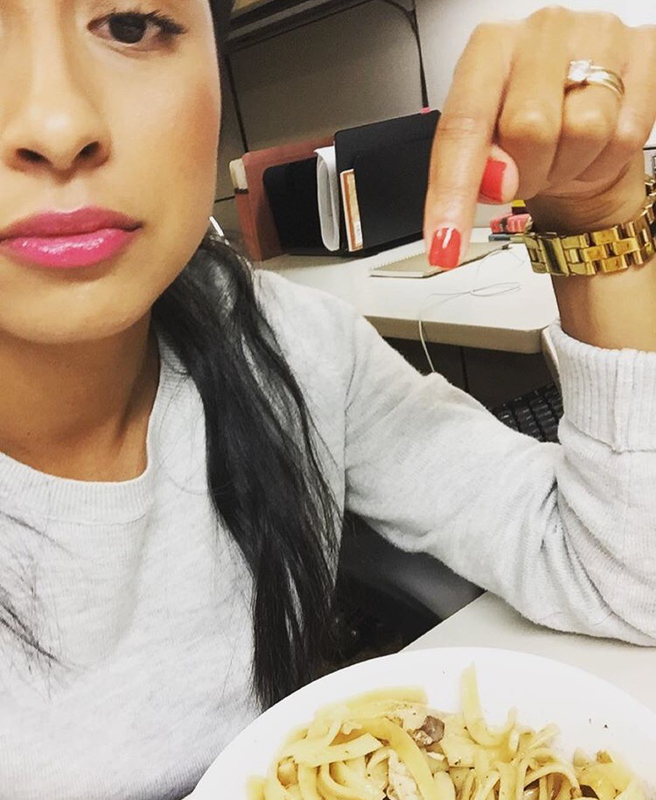 My favorite part of getting ready for a long run is eating carbs, obvs right?! To be honest by Friday I was pretty over carbs and missed the amount of protein I was eating before. Unfortunately, I was having some major calf issues all week and was only able to get through three miles on Thursday. I was literally limping around for days. I felt like Pinocchio and my legs were brittle like toothpicks. I got a massage from the most amazing massage lady Jodie. 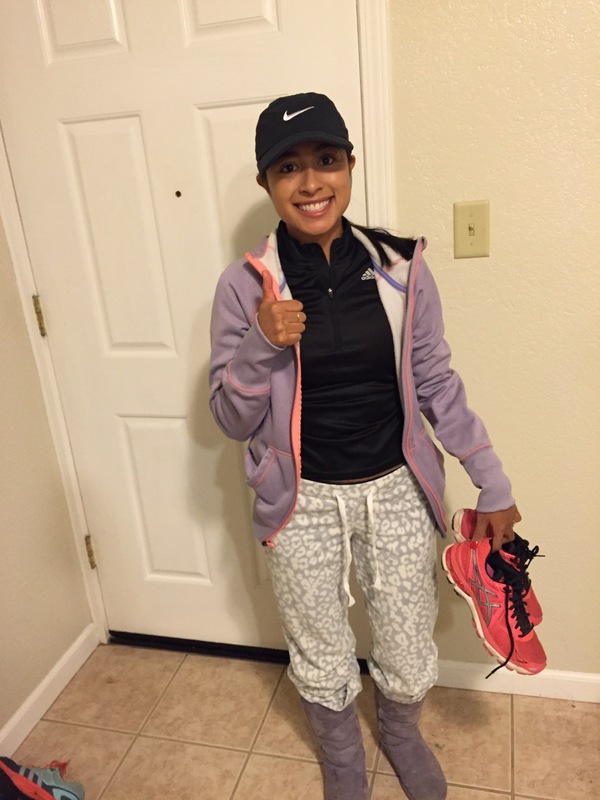 She helped me get my body back to a physical level that I felt comfortable running 20 miles. The day before the race I went to Sports Authority and picked up our bibs. I was on bib pick-up duty and felt pretty excited once we had our race gear. The night before the race I made sure to carb up, drink lots of water, and at least 8 hours of sleep. At 5:00 am my alarm went off and I was already awake. I was nervous and excited for the morning ahead. I prepared my two waffles with jelly and maple syrup, a banana and coffee. It was literally FREEZING! (California+change of weather=Uggs) The morning of the race and I made sure to layer myself for the drive to Clarksburg and went with my super comfy pj bottoms and purple Uggs. I know I look ridiculous but I was warm. Haley and I drove together and we met up with our friends Emily and Jennifer. 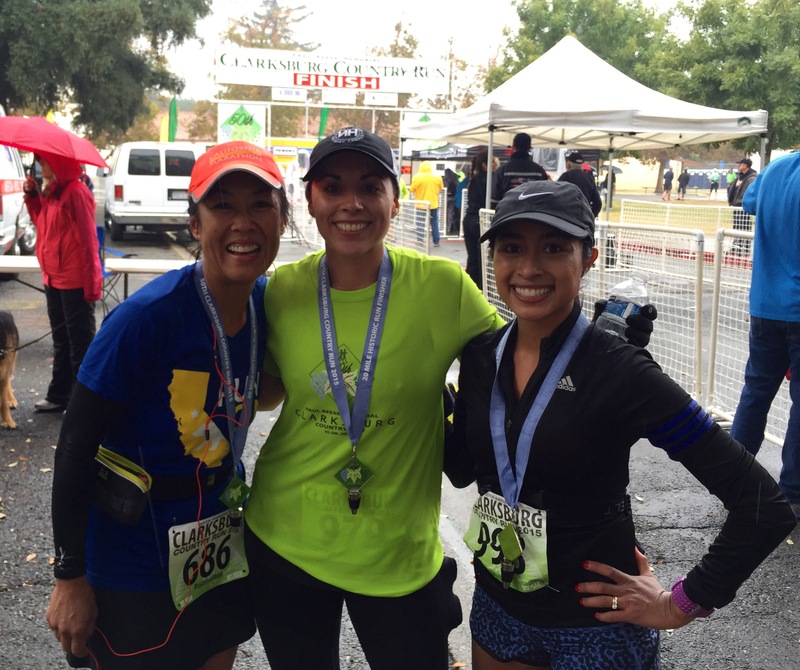 I love getting to a race and seeing the excitment and energy that every runner brings. It becomes contagious and any doubt or nerves you may have are forgotten. The start of the race happened so quickly and I was still snapping pictures when I heard the start sound go off. To my surprise the race had begun and it was time to run 20 freakin miles! The start of the race was beautiful and a nice change of scenery from our normal long runs in Sacramento. The first few miles were cold and my calves were just warming up. For some strange reason my left foot was numb for a few miles. I couldn’t tell if my foot was hitting the ground or turning sideways, luckily it was hitting the floor and I was able to get through it. 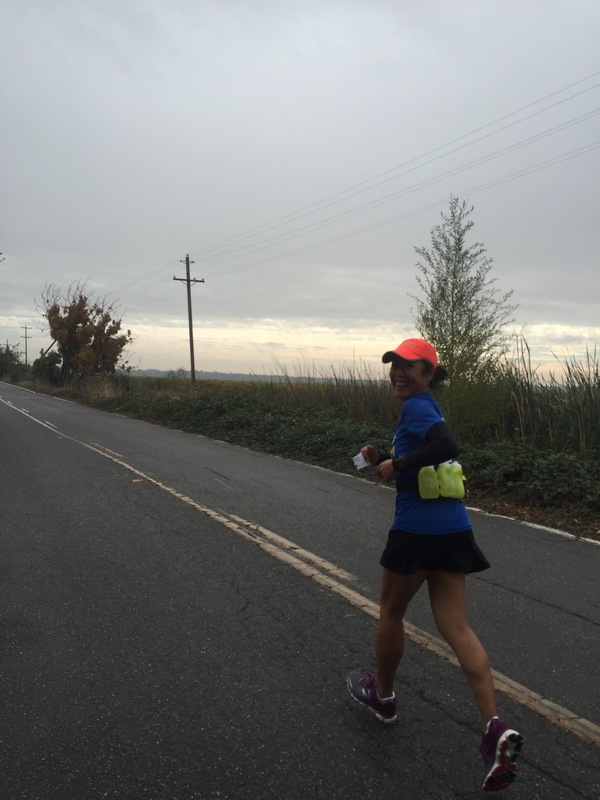 I felt warmed up around mile 7 and made sure to drink my electrolytes (Nuun) and take a GU pack about every 3 miles. We decided as a group we would count the miles in fives and break it up into four parts this way were weren’t always thinking 20 miles, it was less intimidating this way. By mile 10 I was getting really warm and even contemplated taking off my top. We were feeling good and the miles just seem to zoom by. We even got a point where someone called us “the pack” and we loved that someone named us. I was feeling so good even with a little rain, I decided to snap some pictures of Emily and Haley. Oh and of course a running selfie, because why not?! 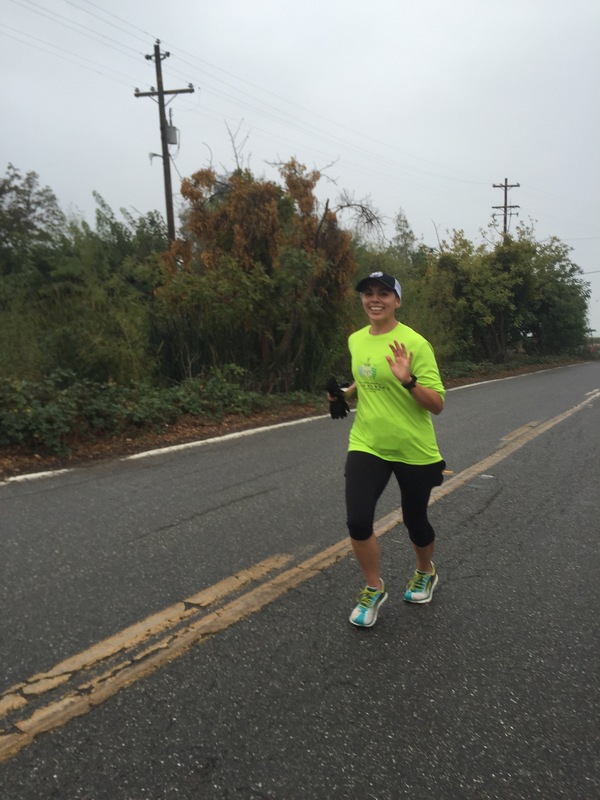 Around mile 15 I felt amazing! 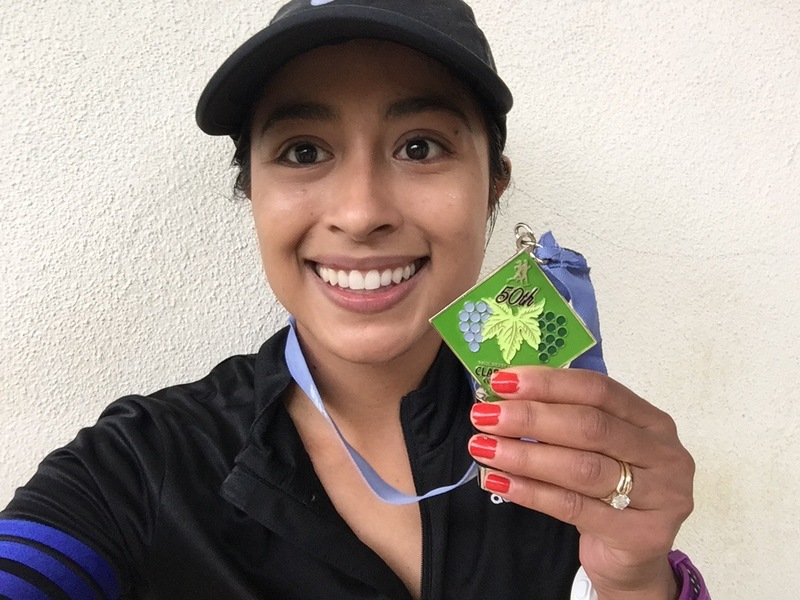 I picked up my pace and was at a comfortable 8:40 pace. It started to rain and it was coming down pretty hard. 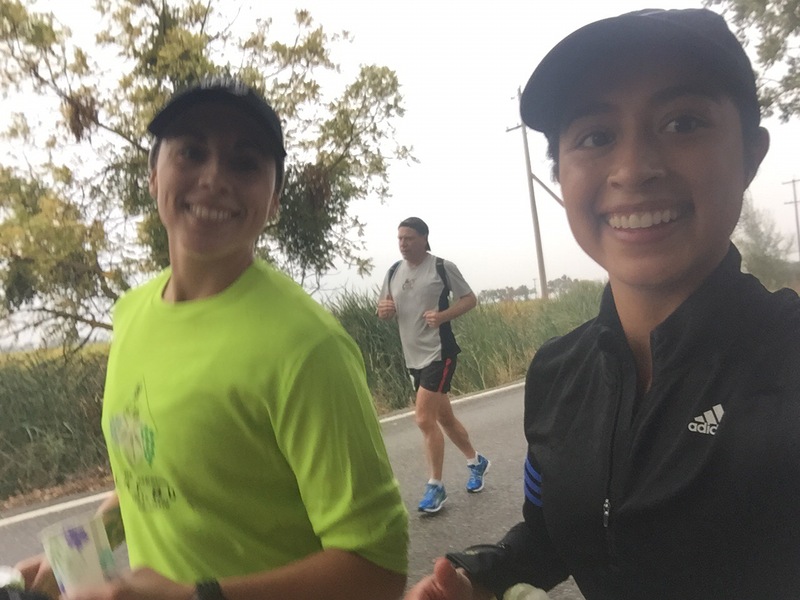 At that point we were passing the other runners from the half marathon and seeing our friends who were at a faster pace for the 20 miler. I was overwhelmed with joy and wasn’t thinking about the rain but the excitement of living in the moment and waiving to my friends and cheering eachother on. At one point a woman yelled, “Running for carbs! How is your calves?”. I was so excited that someone called me running for carbs and could not wipe the smile off my face. I even told the man running next to me “almost there” which he responded “no we aren’t” and I just chuckled. 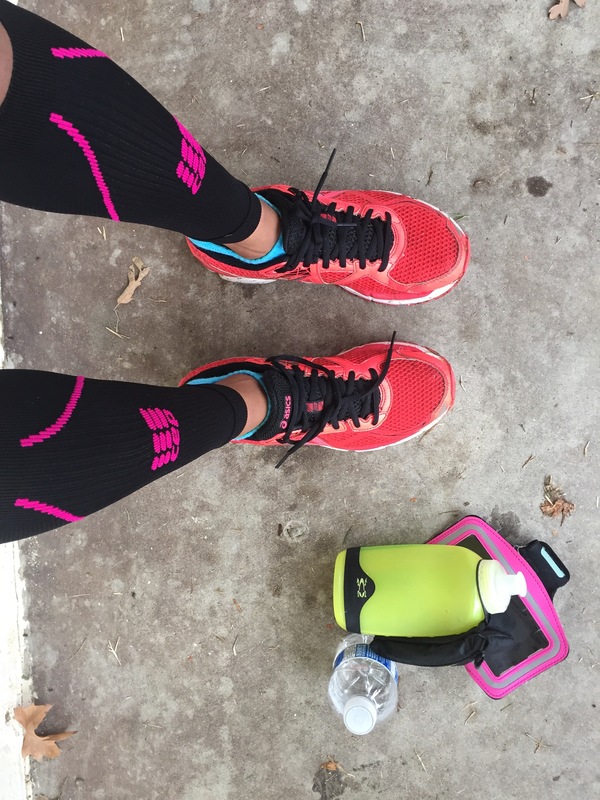 I felt unstoppable and pushed through until mile a8 happened. 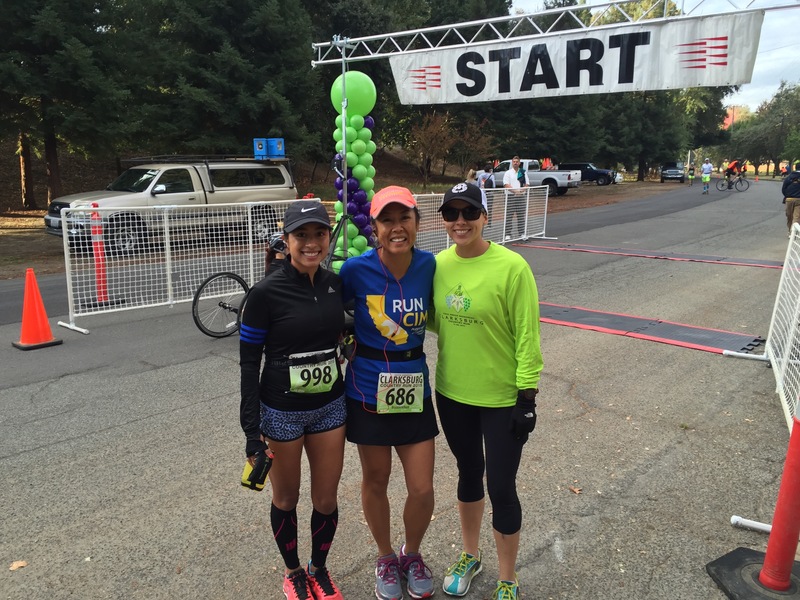 Around mile 18 I started to feel nauseous. I knew my body was telling me something. The rain started to pout down and I felt like my feet were so heavy. Running through puddles while trying not to throw up was a terrible feeling. Luckily, Emily and I were together and I asked her for some electrolytes. She handed me a tablet and I immediately threw it in my water bottle. We both realized at that moment that I was suppose to take it as pill because it was definitely not a tablet. I threw out the contents of my water bottle and desperately pushed through the miles until I finally got to an aid station. Unfortunately, they only had Gatorade which for me is way to heavy during a run. I chugged down a cup of Gatorade and grabbed a second. I was looking for anything to help me get through the last few miles. I kept thinking in my head you only have less than a 5k left you can do this girl. Those last two miles I ran with my heart and I even said that out loud. I wasn’t even sure if my legs were moving they felt so heavy but I could hear the crowd as we were approaching the finish. I made it to finish line where I tried to leap over a huge water puddle but ended up right in the middle of it. It didn’t stop me I kept going and saw Emily shouting at me. My goal was to finish under three hours. I finished at 3:02 but placed 11th in my age group. I was really happy because this was huge PR (personal record) for me. Last year I ran the race and finished at 3:47. I beat my last time by 45 minutes and could not be more proud especially with the weather. 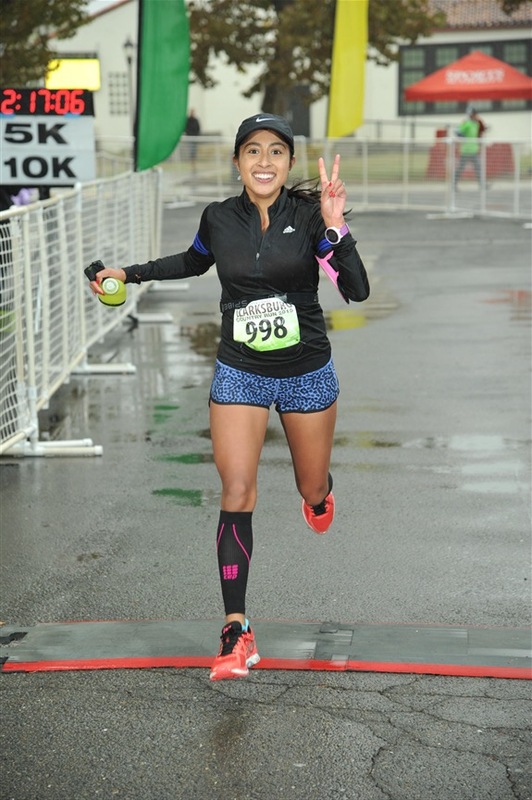 Here is a photo from the race photographer where I was surprisingly looking happy and finishing strong! After checking our times I talked to Dan over the phone and was shaking with excitement, oh I was also soaked. Luckily, Emily’s husband brought an extra towel that literally saved me. My calves surprisingly felt okay and I was happy to change into warm clothes. 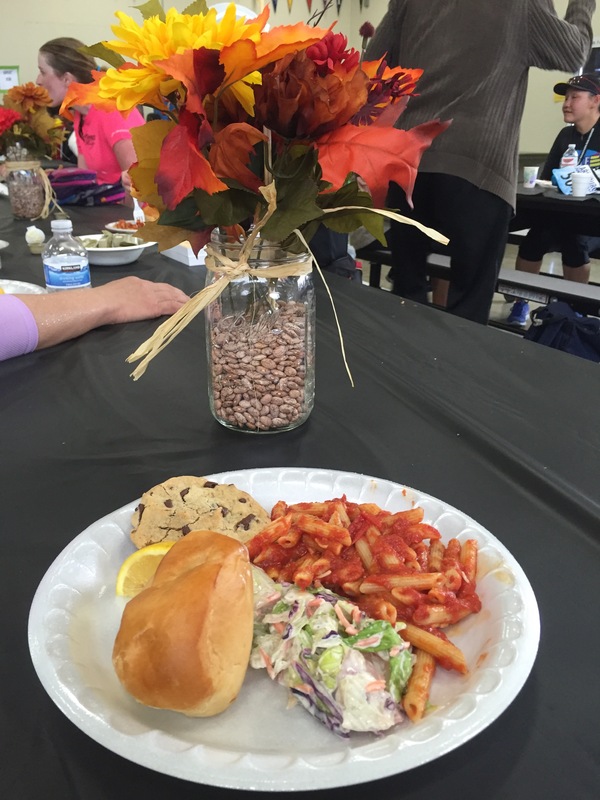 We headed to the cafeteria where they provided us with pasta, salad, bread, and fruit. I’m usually not able to eat a huge meal after a long run but I have been working on eating food within the 30 minute time frame to help replenish nutrients. 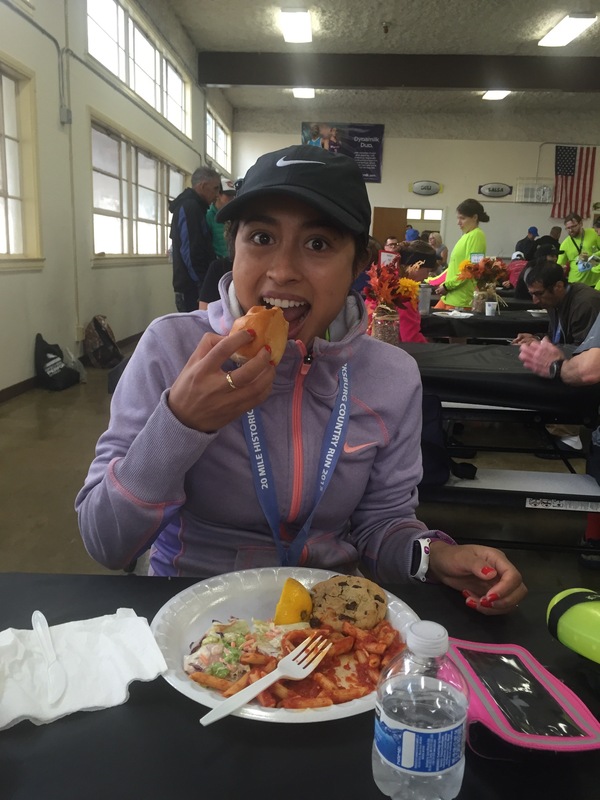 I slowly ate the past and bread and chatted with friends about the race and the weather. It felt good accomplishing that mileage in the rain. 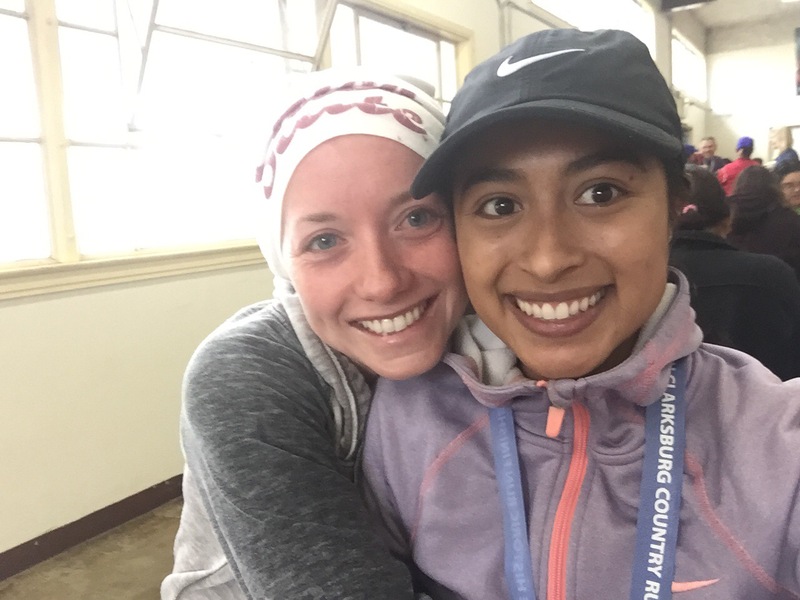 CIM weather is so unpredictable it was great to run in potential weather and give me a better idea about what to change for the big race. 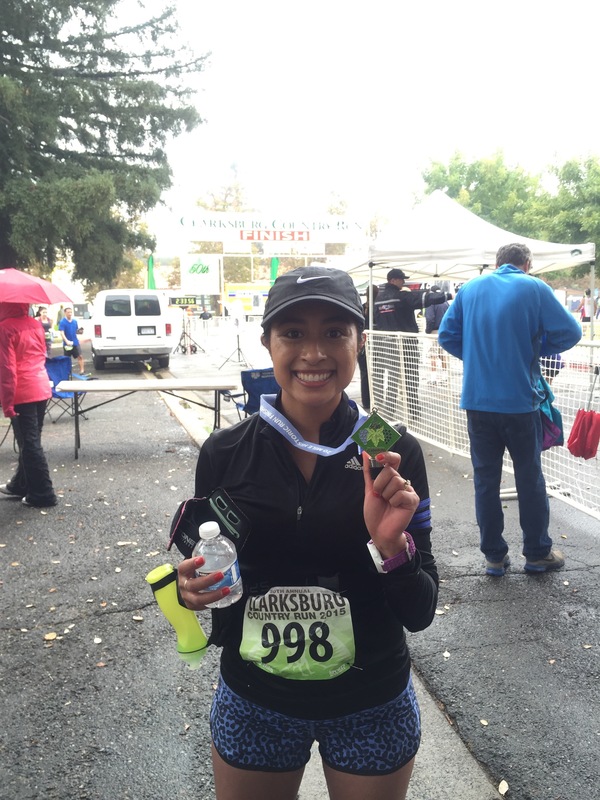 About three more weeks until my second marathon and I cannot wait! !